Leading Chinese biopharmaceutical firm WuXi Biologics, which is pronounced Wooshie, has announced its intention to seek minor alterations to the planning permission granted to IDA Ireland for a biotechnology campus at the IDA Ireland Dundalk Science and Technology Park. The proposed WuXi Biologics facility is to be located on a 23-ha site within the 47-ha IDA Ireland Dundalk Science and Technology Park just off the M1 motorway at Junction 17, where planning permission for a biotechnology campus has been in place since 2008. WuXi Biologics is to seek minor planning amendments to the existing planning permission for its 23-ha site. These amendments involve changes to the layout of the WuXi Biologics site and carpark, alterations to the shape of some of the buildings and a reduction in the number of buildings to be constructed than originally envisaged. 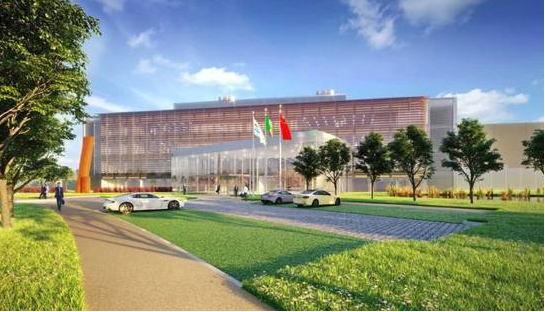 Considering the daily commute of future employees and with a view to creating a sustainable and convenient way for staff to arrive to work, WuXi Biologics is adding cyclist changing, drying and shower facilities to the original plan. Overall, the WuXi Biologics buildings will be both slightly smaller and lower than the original buildings approved in the IDA Ireland permission, but they will occupy the approximately the same 45,000m footprint on the ground. WuXi Biologics is investing €325 million in the new state-of-the-art manufacturing facility which will create 400 high value jobs in the local region over the coming years. It is hoped that permission will be granted in time for siteworks to commence early in 2019 and for construction work to move ahead some months later, for completion by mid-2020. Some survey work will be completed on site in October and November, in preparation for site development. Recruitment for the majority of the projected 400 jobs in the new Dundalk facility will begin in 2020, to prepare the facility for production the following year. In the period ahead, a number of key management and senior positions will be filled. The jobs at the facility will range from manufacturing to technical and quality assurance roles as well as associated administration positions. There will also be significant construction employment opportunities during the two-year development period. The new facility reflects best-in-class industry practice globally and represents a significant step along the journey towards the ‘Factory of the Future’ concept. The facility will incorporate innovative technology optimised for the flexible production of a wide range of biologic drugs for a variety of customers both in Ireland and internationally. WuXi Biologics’ mission is to accelerate and transform biologics discovery, development and manufacturing to benefit patients worldwide. Headquartered in Wuxi, Jiangsu, China, with three manufacturing sites located in Wuxi, Shanghai and Suzhou, the company is the main player in China’s biologics services market. The company also holds leading market positions globally and is quoted on the Hong Kong Stock Exchange. WuXi Biologics works with 200 partners worldwide, including 13 of the 20 largest global pharma companies. WuXi Biologics’ services are designed to accelerate the discovery and development process for the latest generation of biopharmaceutical drugs, whilst also reducing the cost of production. As a fully-integrated biopharmaceuticals contract manufacturing company, WuXi Biologics provides its partners with the advanced capabilities, cutting-edge technologies and comprehensive solutions to enable them to develop innovative biologics medicine.